Let’s make one matter clear; regardless of where my heart declares home, my GAA heart will ALWAYS sing for the Deise team. Housekeeping aside, there are reasons within reasons that this place does hold my heart, and that I am happy to consider it the home I have made for my little family. I never settled into rural life in the seventeen years I lived there. Too remote, too isolated, too far away from everything fun and lovely in the world, and all the people I wanted to see. My heart was in cities; in a buzz, where I could meet people and do fun things and see more than trees and grass and endless cow-jams on the way home. The day I viewed University College Cork at the open day, a shift happened. Standing outside theÂ Student Centre, looking up at the Honan Chapel, I declared to my then-boyfriend (a student there), that I had found my place. When I did eventually move down the following year, myself and a friend who had both been accepted onto the same course finished our first induction day by lying on the grass facing the Quad, looking up and going “Wow. We go to school here. This is incredible.”. And it was. Cork was filled with people from every faction of society, filled with new experiences, filled with new life. Seven years later, still living here, that love letter in my heart to this place still exists. Not all of the time, understandably – there are some times where I need to leave to realign my love for the place. The rain can have that effect. I’m still discovering so much more of this city and it’s surrounds. New walks, new places to visit. It can be easy to get jaded by the day to day, but this place offers so many chances to escape from the repetitive drum of traffic and rush. Taking a walk around the Lough is calming, like escaping the city completely for a few minutes because the nature drags you out of that urban setting. I say calm, until the swans go a bit nuts and leave me half-running, half walking (as not to look TOO ridiculous) away from a fear of their bite. I’ve sat on the bench for hours with friends over the years, talking out the trials and joys of life, just watching the water settle. Walking out towards Blackrock Castle along by the Marina is beautiful on a sunny day, and definitely one of my favourite places I’ve found in the last while. I can’t believe it’s taken so long for me to discover such a truly beautiful part of the world. Cork is a small city. I have short legs. The two of these combine rather well, as despite loving walking, it is nice to be able to get from A to B without HAVING to walk for millions of miles. It may rain a lot here, and I may lament about how much lovelier it would be if it had a roof, but it’s filled with lovely places to duck into out of the rain. There really isn’t anything better on a winter day than popping into O Conaill’s for a hot chocolate. My personal favourite is Milk and White. Brunch in Bodega is absolutely divine, and buggy friendly to boot. Staff, for the most part, are friendly and helpful wherever you go, and the options for where to go are growing all the time. There’s a feeling of general friendliness bubbling through the city, which can be hard to find in other places. It’s nice. It’s small. It makes it home, the place I love to be living. This is where I met my partner, fell in love, gave birth to my son. It’s where I’ve witnessed him growing into the little boy who drives me crazy and makes me laugh. It’s where I’ve met some of the best people I’ve ever met, and sat with large pots of tea talking out the troubles of the world. There’s been laughter and tears and overall smiles. I’ve even got an accent twang that I can’t quite get rid of, much as I try. This may not be my forever home, we don’t know what the future holds, but for now, I’m sure loving that I’m living where I’m living. Keep up with all goings on from my life with toddlerÂ onÂ Facebook. I am one of theÂ finalists in the Boots Maternity and Infant Awards in the â€œBest Parenting Blogâ€. ThankÂ you to everyone who voted in the first round, it really does mean a lot.Â Voting for the finalÂ is open until 28th August and isnâ€™t restricted to just Ireland, so wherever you are, you can take part. Â You can vote by clickingÂ hereÂ or on the purple button above and choosing BadMammy.com â€“ thatâ€™s the first option, nice and easy!Â Use the Facebook option and it takes five seconds â€“ thatâ€™s your good deed for the day done!Â If you like the blog, Iâ€™d really appreciate your vote (and sharing with others in your life to do the same always shares the warm fuzzy feelings). Thanks! As someone born and raised In Cork I am still finding new magical places to explore in Cork. This is lovely, Lisa! I love reading about the things that make people love a place. And, you know what? It’s always the tiniest of things. The little details that can easily go uncelebrated. A favourite place for coffee or a walk or a certain view from a certain angle. For such incredibly complex beings – we humans really only need the simplest of things. Hiya I popped over from the linky! 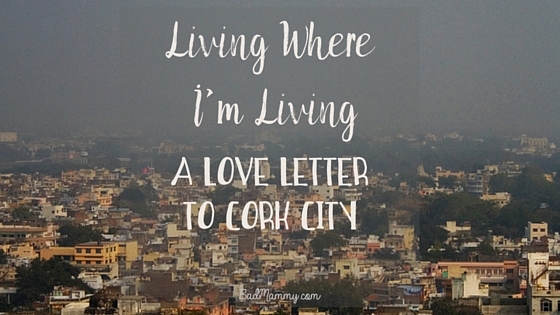 I have never been to cork but it is definetly on my wish list! It looks so pretty!